John Henshaw shared a post. “However an earlier ‘decision memo’ that came to the same recommendations that were contained in the ‘cabinet memo’ was signed by President Trump, according to documents obtained by Newsweek. “Military forces always have the inherent right to self defense, but defense of the border agents on U.S. soil is new. In addition, troops have been given additional authorities in previous years to assist border agents with drug interdictions, but the widespread authorization of use of force for thousands of active-duty troops is unique to this deployment. “Each domestic deployment of troops to any of the 50 states or U.S. territories is governed by Chairman of the Joint Chiefs of Staff Instruction 3121.01B, ‘Standing Rules of Engagement, Standing Rules for the Use of Force by U.S. Forces.’ Two annexes, L and N, are specific to Defense Department missions in support of civilian authorities. ☢️ Demand Sec. 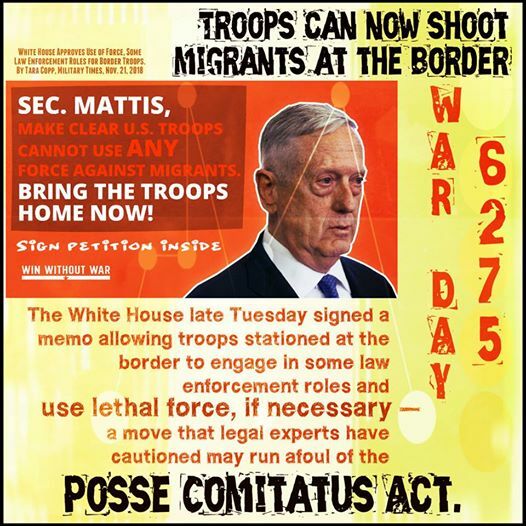 Mattis make clear that U.S. troops are not authorized to use deadly force at the border, and to bring the troops home immediately. ☢️ White House approves use of force, some law enforcement roles for border troops. By Tara Copp, Military Times, Nov. 21, 2018. This president needs to be removed. Previous DJ Trump is OK with racism, sexism, misogyny and war crimes.